Well, I have story for you that every camper will appreciate. You come back after a long but enjoyable day on the trail or your backpacking and the weather has been cold and nasty. Regardless of which situation you relate to, the next chapter in this story is setting up camp. Once the fire is going, you are ready to fix a hot drink. Your choices are coffee, tea, hot chocolate or hot Jell-O. The latter is an old caver’s trick. Well, regardless of what drink you choose to warm your bones up, there is still a lot to do and carry. If you like coffee, you have the pot, grounds, maybe a filter, and the add-ons, which include creamer and sugar. On the other hand, if you like tea then you have the pot, tea bags or loose tea and additions. This can include sugar, creamer (milk) and/or lemon. Hot chocolate has fewer ingredients to carry but you still have the pot and who can drink hot chocolate without marshmallows, which again is something else to carry. While these extra ingredients may seem small they do add up and keep in mind what you carry in you must carry out. This means bags, boxes, and leftover add-ons but what is one to do when you want a hot drink especially a nice cup of tea. Well, the answer is simple and only requires a pot for water and cup. What is this product you may ask? The answer is Tea Drops. This product consists of aromatic herbs, tea leaves, and sugar. The best part of this product beyond the wonderful taste is the fact that there is no need to steep the tea. This means I can drink my tea sooner. Also, I no longer have to carry my sugar around for my tea since this tea contains sugar. The founder of Teadrops has thought of everything. Not only is sugar and aromatic herbs included in every tea variety, they also are not tied down by those pesky tea tags or labels. Each tea variety is identified by a shape and color. There are several different varieties and this is explained when you get your tea in the mail. Once you get your tea, you will simply need to heat water and pick your tea, which is the hardest of this process. After you have selected your tea, place your drop in your cup, and heat water. Next, pour your hot water over your tea drop and enjoy. It is that simple. The amount of packaging is also minimal but very attractive and personal. First, you have a choice of a wooden or cardboard box. The wooden box is very beautiful and has picture directions by which one can follow while making their tea. Regardless of which box you choose, your tea box will be individually wrapped in organic paper, tied with natural ribbon and sealed with a wax stamp. So the next time you plan a camping or backpacking trip, stop and think about you really want to have to carry. For me, I will no longer take the menagerie I had to carry before for a cup of tea. 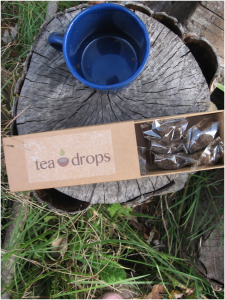 Tea Drops have taken away the weight of preparing a cup of tea at camp and best of all they taste wonderful every drop. No bun intended.